In an effort to promote community service and to help our staff maintain the garden, YGP hosts Weed ‘N’ Feed nights. 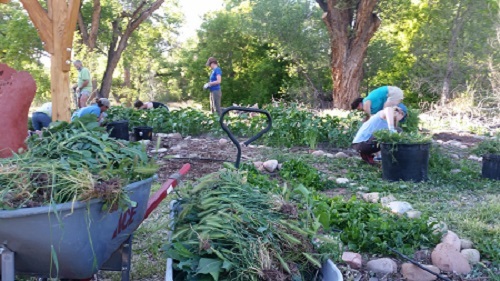 At a Weed ‘N’ Feed, anyone (community members or visitors of all ages) can come help weed in the garden for a few hours, and in exchange, YGP prepares a nutritious meal with freshly harvested garden ingredients for volunteers to enjoy. Weed ‘N’ Feeds are a great way to learn about gardening & to socialize with fellow community members. New – Child care zones! Child care zones are for parents who need an extra hand and want to participate! Weed ‘N’ Feeds are held every other Wednesday from April through mid-October, starting April 3, 2019. See our calendar for dates. Weeding begins at 6:00PM with dinner to follow. Please be on time to weed if you plan to eat. No RSVP is needed. To participate, meet on the YGP patio by 6pm. Volunteers of all ages are welcome to attend. Each meal is vegetarian. Sorry, we cannot promise to cater to other dietary restrictions. Child care zones are provided. 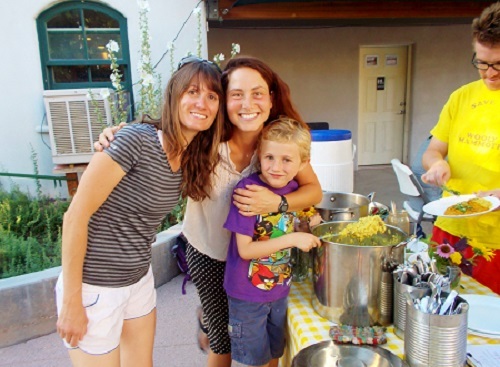 Weed ‘N’ Feed meals are prepared by Volunteer Guest Cooks from the Moab community! Guest Cooks include individuals, families, clubs, and/or organizations. If you (or your organization) are interested in being a Guest Chef for a Weed ‘N’ Feed, GREAT! Email the Community Programs Coordinator, or call our office at 435.259.2326 to see which Wednesday will work best!